Sometimes the corner market can yield surprises, especially if you've got the munchies. I wandered into one recently to get a soda and saw this bag of delight sitting on the shelf. 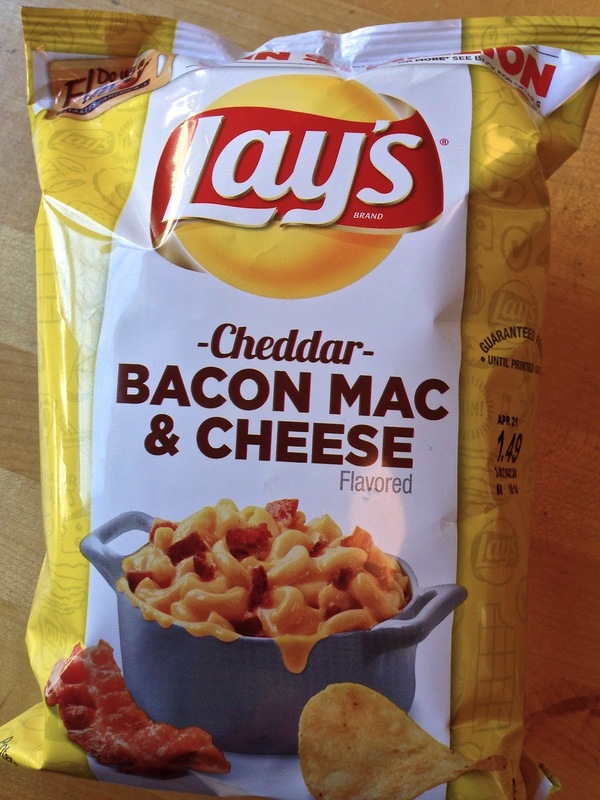 I remembered that Lay's did another one of their fan created flavor contests and they had paired it down to 4 flavors for folks to vote on. Evidently, the winning flavor was wasabi ginger--which makes me gag a little bit--but there still seem to be some of this other one floating around. I would have thought this had a better chance of winning since it has the hallmarks of comfort food. Still, I was interested to try some and plopped my money down and ran home with my bag. I gripped the edges of the bag tightly and slowly pulled it apart. The immediate aroma from the bag nearly attacked my senses with a smell that bordered somewhere between fake bacon dog treat and vomit. It was strong, like a mushroom cloud invading the apartment. I kept the bag at arms length and debated should I really even try one. Ha, who am I kidding, yes I'm gonna try. 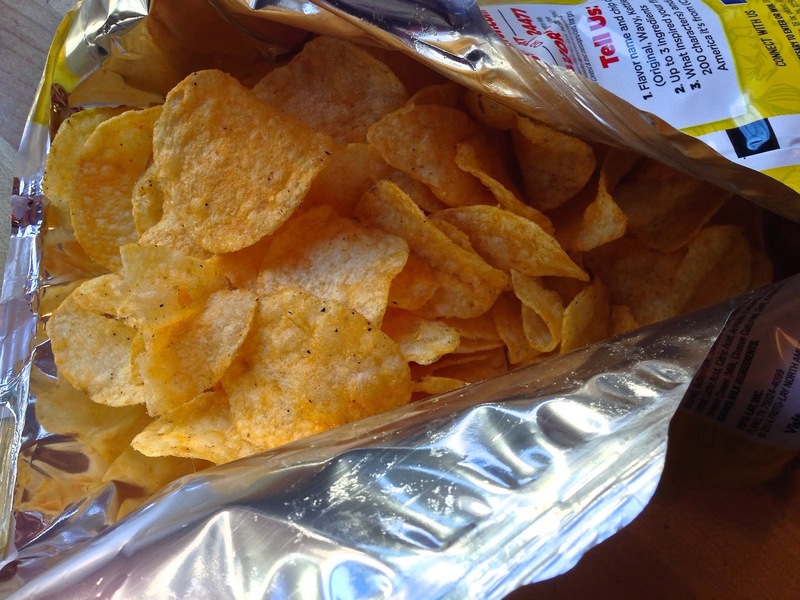 I take a chip out of the bag while simultaneously holding my nose and pop it into my mouth. The instant flavor I get is salty, then I'm hit with notes of some cheesiness and more salt, but not really any bacon. I felt like a I was in that "Golden Girls" episode where Rose makes that foul smelling crispies dessert and the girls all sit around the table eating it while holding their noses. Yeah, just like that. The chips just taste like salty cheesy potato chips and beyond the stink I can see why they didn't win. I'm still wondering how they thought they could infuse the mac part into it as none of it really brings back memories of bacon, mac or cheese. I didn't even finish the bag and neither did the SO. Normally he can eat anything, but not these. Kind of tells you how bad they smelled and how ordinary they tasted. Well, while they didn't bring up any childhood comfort food memories I did get that "Golden Girls" flash so I will take "comfort" in that, but I definitely wouldn't recommend these--unless you are out of Beggin' Strips for the dog. Something from some Guys about something called halal is coming to town. East Coast transplants seem excited about this. Marlowe is spinning off it's own burger with a new joint called Marlowe Burger--in its former space. Catch all that? That old Dixie Presidio space has been snapped up and cut in half to make a hipster beer hall. Will they come to the Presidio for it? The food and culture of Jewish Delis featuring local fave Wise Sons. Coffee shops do open in other places besides the Castro. This Inner Sunset spot is also doing that "toast thing." And in more Sunset news (shocking!) they now have their own micro-brew pub restaurant spot. But will hipsters go to Sunset for it? Local spots get some James Beard Award Semifinalist appreciation, probably because Le Bauer is on the nominating committee. Craftsman & Wolves is expanding their baking empire to Russian Hill. TOURISTS DON'T PANIC! DOTTIE'S TRUE BLUE CAFE IS ONLY TEMPORARILY CLOSED! Locals like lining up elsewhere and aren't really concerned. Since Source in SOMA closed don't fret, there's a new vegan place opening in the Richmond. The old Patio Cafe space in the Castro finally back in action? I'll believe it when I see it.